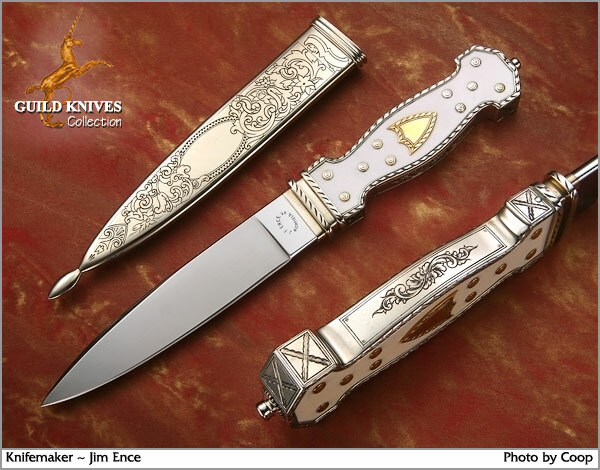 This California Dagger, after the 1850 style made popular during the Gold Rush by early knifemaker Michael Price, is a collaboration of Jim Ence and his friend and neighbor Buster Warenski, both knifemaking greats. Gold Shields and 20 Gold Studs on an engraved Silver-wrapped handle with Ivory inlays, are this teamâ€™s exacting replica of an historical San Francisco Dagger, even down to the Ivory being a bit darker on one side than on the other. The originals go for over $100,000.